Anne Norberg of Sew Darn Quilt learned to sew when she was four years old, designed her own line of apparel in high school and has developed an incurable addiction to quilting. 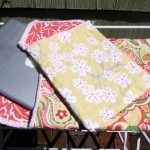 Her story is as delightful as her creations – quilts, bibs, onesies, iPad cases and more. I started sewing when I was four years old. Instead of putting me into daycare, my mother enrolled me in sewing classes at Tina’s on Madison – a wonderful sewing shop that is still owned and managed by Tina after all these years. At Tina’s I learned the fundamentals of construction and design. As early as kindergarten, I started designing my own outfits – and a million pillows and cases adorned with as many ruffles and ribbons as a little girl could imagine! I continued to sew through my teenage years; while my friends were getting new cars for their 16th birthdays, my mother saved up and purchased my first Bernina. I still use the very same machine today, twenty years later. With the exception of my own wedding dress, I’ve designed all of the important dresses of my life – Sadie Hawkins, prom and graduation. I designed several clothing lines in high school with my best friend Lily, who now owns Sunshine & Shadow. I always thought of myself as a tailor; I never thought I’d have the patience or the mechanics to be a quilter. My friend Sarah, an accomplished quilter, spent the weekend with me three and a half years ago and helped me construct my first quilt. I instantly fell in love with every aspect of the process – picking out the colors, the pattern and lead borders, and the exact science of measuring, cutting and piecing. Since then, I’ve honestly been addicted! I made 18 quilt tops in the first year and realized that I couldn’t afford to send them out to be quilted. I found a shop in Olympia, 65 miles away, where I could rent their quilting machine by the hour. I was able to complete each and every one of them myself. 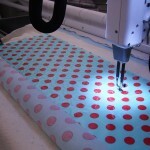 Quilting adds a completely different dimension to the craft. Now that I am the proud owner of my own long-arm after traveling to rent for the last three years, I look forward to teaching individual lessons. I want to empower other top makers and teach them the skills needed to take their craft to the next level. After three years, I have run out of people to give quilts. Finding myself unemployed after 12 years in non-profit management, I decided to try my hand at selling my work both on Etsy and at local craft fairs. 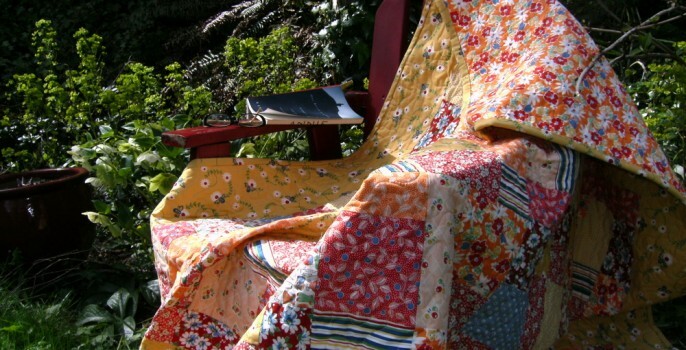 Quilts get used and treasured instead of being hidden away in a closet, attic or basement. Why? Quilts are constructed and designed with more than utility in mind – they are a celebration of love and devotion within the family. Quilts are given in celebration of major life events – a newborn, graduations and weddings. Traditionally, they’re made by several members of a community that came together not just to construct blocks of the quilt, but to bond to one another through times of grief, happiness and celebration. Each quilt tells a story, both through its intent and design. I’m attached to every quilt that I construct. Each one tells a story of who I am and what I was going through at the time. The quilts become so personal that I name each one. No two quilts are ever alike; I believe their uniqueness is what makes quilts so treasured as gifts. Quilting is losing its momentum in contemporary craft because of the time involved. I believe that during these tumultuous times, people are looking to the past and treasuring the quality of lost arts. They are drawn to pieces that represent traditional craftsmanship and time-honored traditions. I hope that my quilts will be seen as timeless treasures that because of their quality, and be passed down from generation to generation. I’m amazed at the daintiness of quilting stitches. 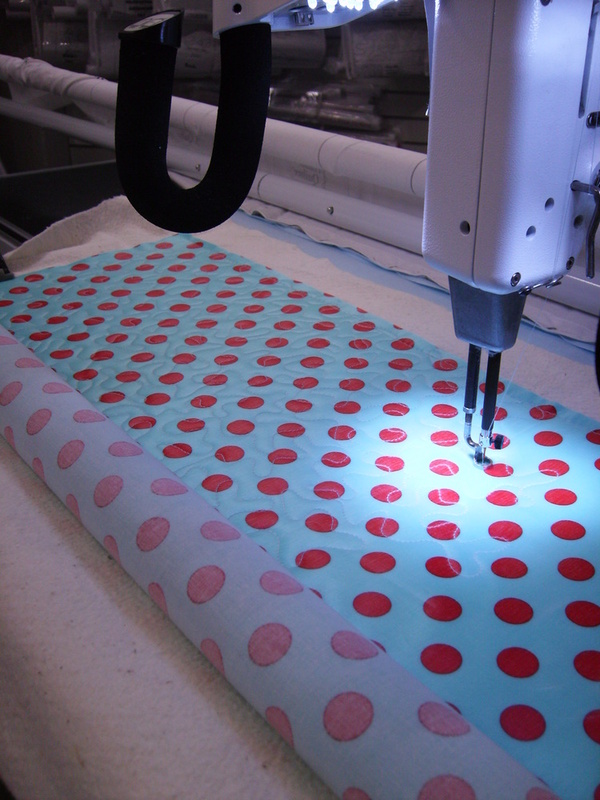 Are your stitches done by hand or with a sewing machine? 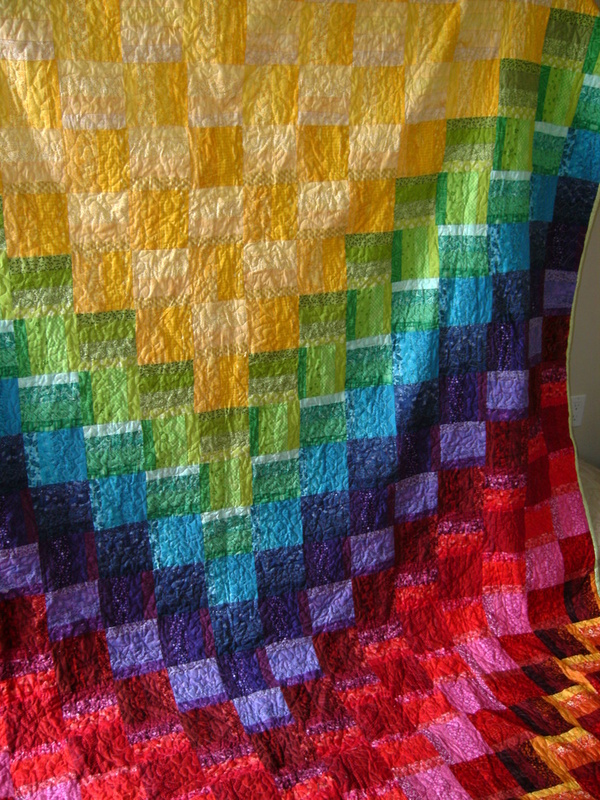 Making a quilt is an involved process and uses many techniques. I piece together my quilts using my trusty 20 year old Bernina. Six weeks ago I finally purchased my first long-arm quilting machine so that I don’t have to travel to Olympia any more. 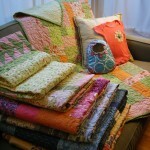 It’s a Handi-Quilter 16 that’s taken over my husband’s side of our studio. Having my own machine is a dream come true! I’m looking forward to offering professional quilting services for clients who love to construct tops, but don’t have the time to quilt them. I also want to provide private lessons and to rent out the machine by the hour. Not only is there no other service provider in the area, but I want to offer people the amazing opportunity to learn quilting for themselves! You mentioned that you’ve donated quilts. Who were the lucky recipients? 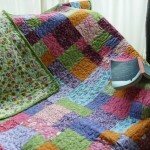 I’ve contributed two quilts to local charities near and dear to my heart. I’ve been solicited many times through Etsy to donate my work, but given that I’m just starting out I have to make tough decisions about donating. The last quilt I donated was to the Moyer Foundation, established by Jamie Moyer, a former pitcher for the Seattle Mariners. They requested “Victor Victorian” for an auction to support Camp Mariposa, a summer camp dedicated to helping children of addicted families. This cause is very close to my heart and I was more than happy to contribute. 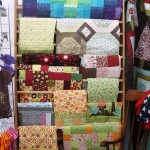 How do you go about picking colors, patterns and designs for your quilts? I used patterns when I first started out. 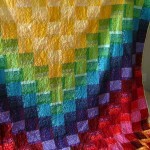 Now I design most of the quilts that I construct, or try different design elements with patterns I’ve used in the past. 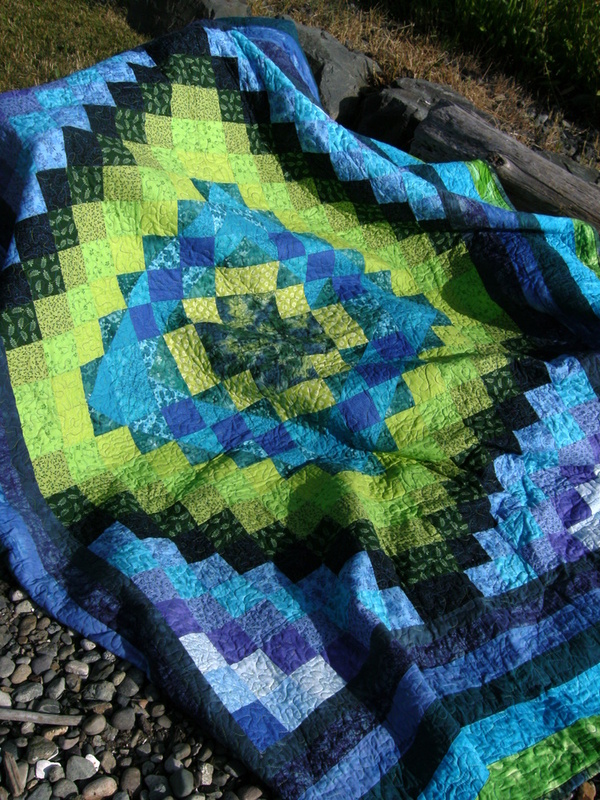 I’m always looking for new patterns; I often make quilts just to figure out how they’re done and use the techniques in the designs that I create. Quilting is complex geometry coupled with artistic design; I’m constantly trying to work new shapes and designs into my quilts. One of my greatest pleasures is picking out fabric. I do most of my fabric shopping on quiet afternoons, relishing the full sensory experience of my favorite shops. I do some of my shopping online, but I prefer the tactile experience of touching and savoring the fabrics. 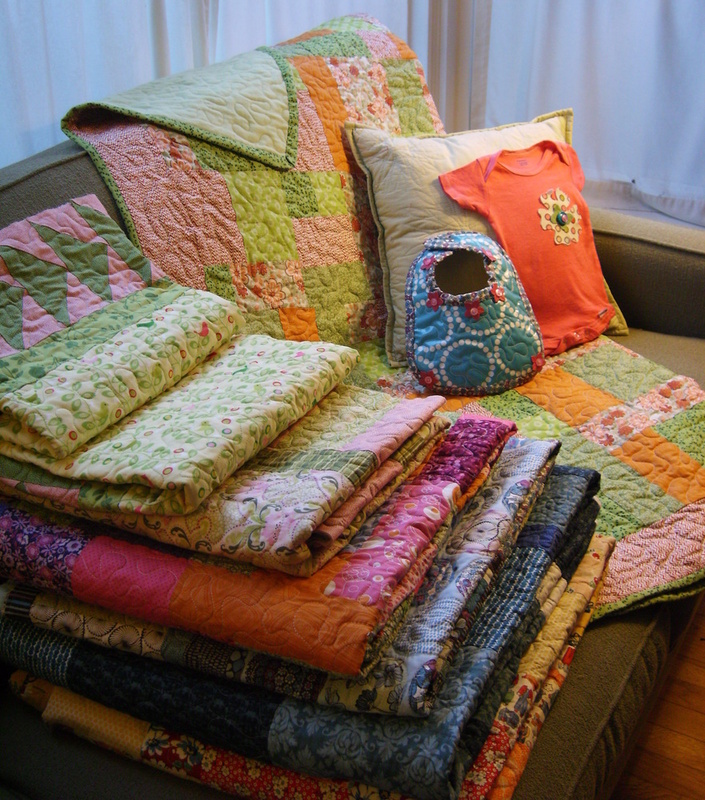 Some might even consider it an addiction, but any quilter is sure to be afflicted with the same ailment! Summer festival season is upon us. 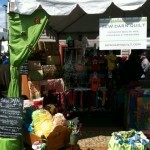 What’s your experience been selling your wares in person? It’s already been a blast! 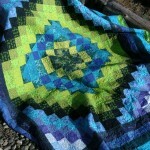 I just opened Sew Darn Quilt in April, so this is the first summer vending my wares. I’ve participated in 2 shows thus far and have been overwhelmed by the positive response. 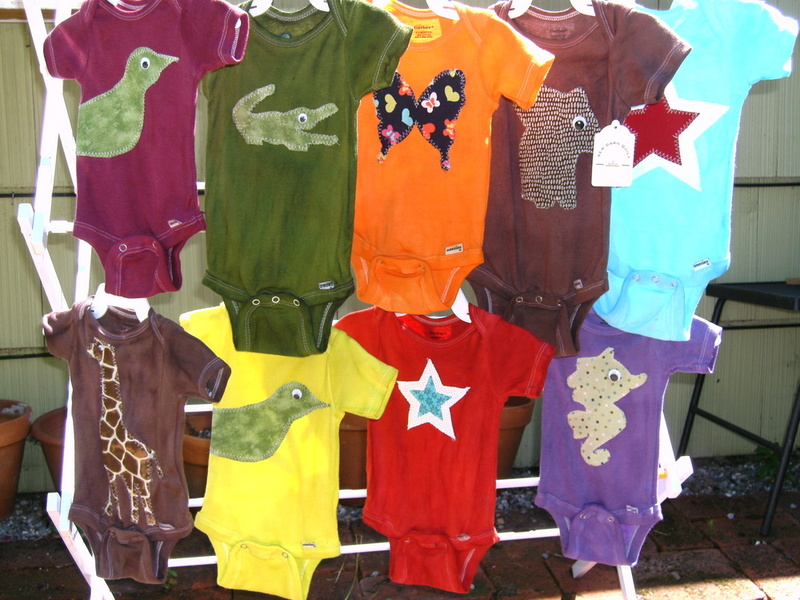 In addition to my quilts, I also have a line of hand-dyed, appliqued onesies, quilted laminate bibs, fleece throws, plush toys, mobiles and other accessories. I’ve concentrated so much of my time preparing and stocking inventory for my shows that I haven’t uploaded 95% of it to Etsy yet! The best part of vending in person is meeting my clients, getting feedback and commissioning work. 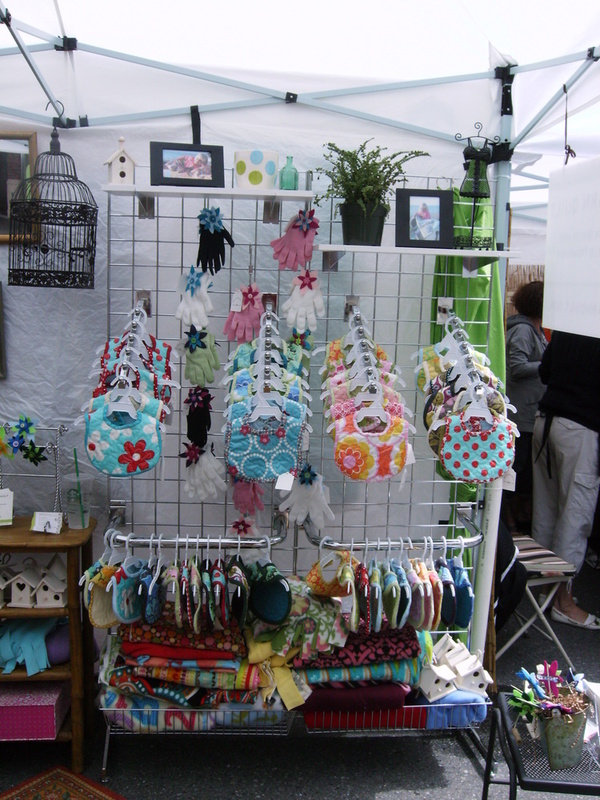 I’ve taken on a dozen new clients from the shows, designing and creating everything from quilted laptop bags to full nurseries – including baby bumpers, wall hangings, mobiles and coordinating fleece toys, custom organic quilts, pillow cases and shams. 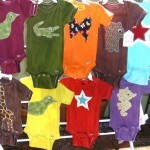 I look forward to continuing to sell my wares and market my brand. What have you learned since joining Etsy in April? Opening my Etsy shop this past April has taught me so much about how to operate a small cottage business – particularly about time management! 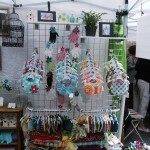 Managing an online presence in addition to selling my wares at local arts and crafts festivals has been a juggling act. As a new shop owner, it’s been valuable to study all of the articles for new sellers on Etsy and stay up to date on craft websites. Given my full docket of summer and fall shows, I find that I have to prioritize and budget my time to effectively market myself while still working on inventory. It’s been more important for me to have a solid stock of inventory at my live shows than in the online shop. One can spend 24 hours a day listing, re-posting and developing their website – but if your booth has nothing to show for itself, then the rate of return on show fees goes down. Once the busy vending season slows down, I’ll be able to spend more of my time on my Etsy site as well as developing my website and other online presences. Where do you see yourself and your shop one year from now? Like so many people out there, I had to rethink my situation after losing my job in late March. 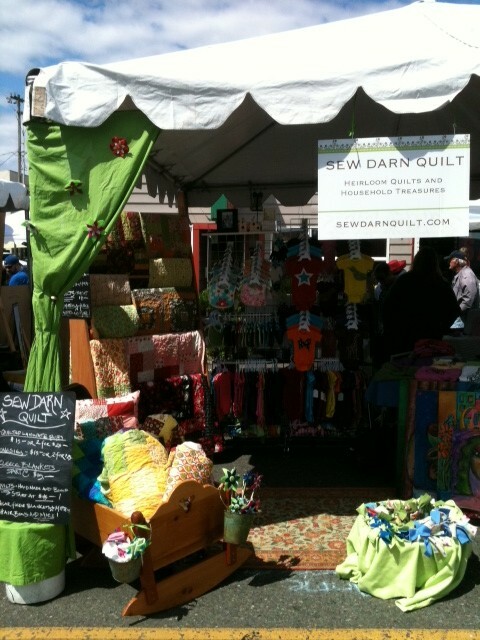 In the process of re-grouping and figuring out the next direction, I turned to what gives me the most enjoyment – I decided to try my hand at vending my quilts and other accessories. Much to my astonishment, I’m in the process of developing a solid business plan. In a year, I hope to be in the black and working full time at developing my quilting enterprise! I want to acquire enough commissions to support myself, while continuing to vend my wares at fairs and online. I’m also developing other product lines, such as a small apparel line and a line made with organic plant and mineral-based dyes. 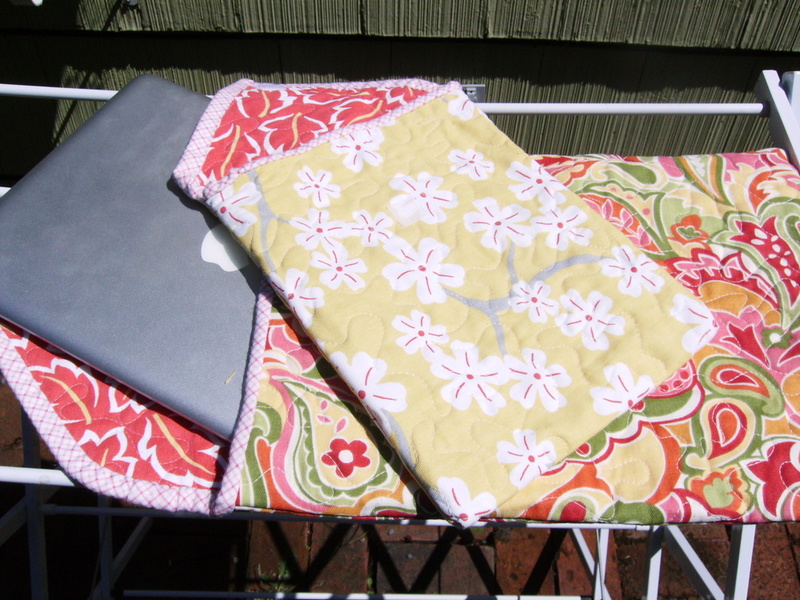 I am always working on new quilt designs and new modern quilted accessories like laptop and iPad travel cases. My baby laminated bibs have been well received; I’m working on a dignified adult bib – or as I call them, shirt savers – for our ever-growing elderly population who deserve to dine with dignity! 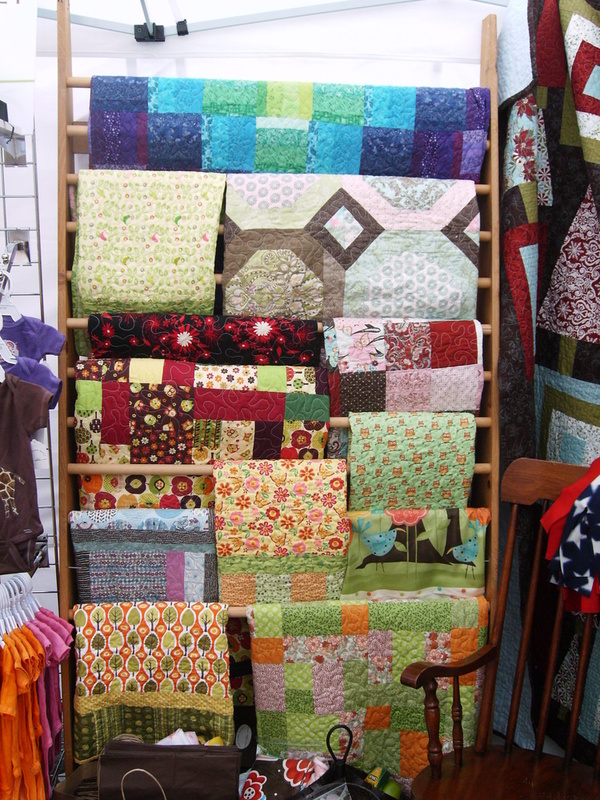 It is my dream to partner with a shop owner and support the education arm of a local quilting store. I’d love to teach classes and workshops and hopefully one day have my own pattern line that is uniquely Annie! Annie is well on her way. During the course of preparing this interview, Annie had her first – and second – Etsy sale. Now that doesn’t happen everyday. Congratulations and best of luck in all your ventures, Annie! Currently, you can find Annie at her Etsy shop and on Facebook. 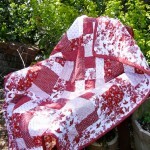 Next month, her online shop will be open at www.sewdarnquilt.com.